Indian Ridge Oaks is a small development close to the 192 Disney entrance. It is a mixture of rental properties and private homes.The sub-division also has a large communal pool, childrens play area and tennis courts which are available for our guests use. Our Villa is beautifully furnished and well equipped throughout, it comfortably sleeps 10 people and a baby. 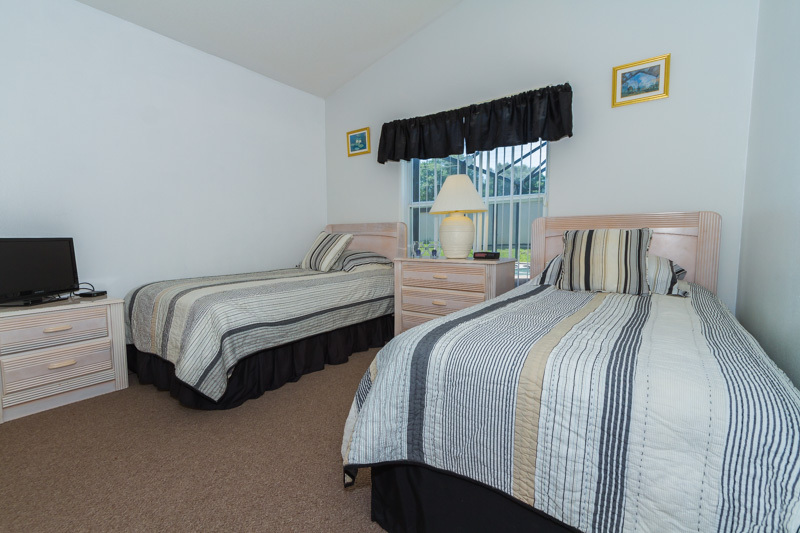 Both of the double bedrooms are professionally furnished. The comfortable master suite is light and airy having patio doors which open out onto the large pool decking and lanai. The master bedroom has a king sized bed, Flat screen Smart LCD/HD cable T.V. with internet access, clock radio alarm and telephone. It also has the benefit of a large en-suite bathroom with roman tub, over sized shower and double vanity unit, which leads into the spacious walk in closit. The second double bedroom is also beautifully furnished with a queen sized bed, cable T.V. and radio clock alarm and I pod docking station as well as having full wall closits for all your holiday attire. 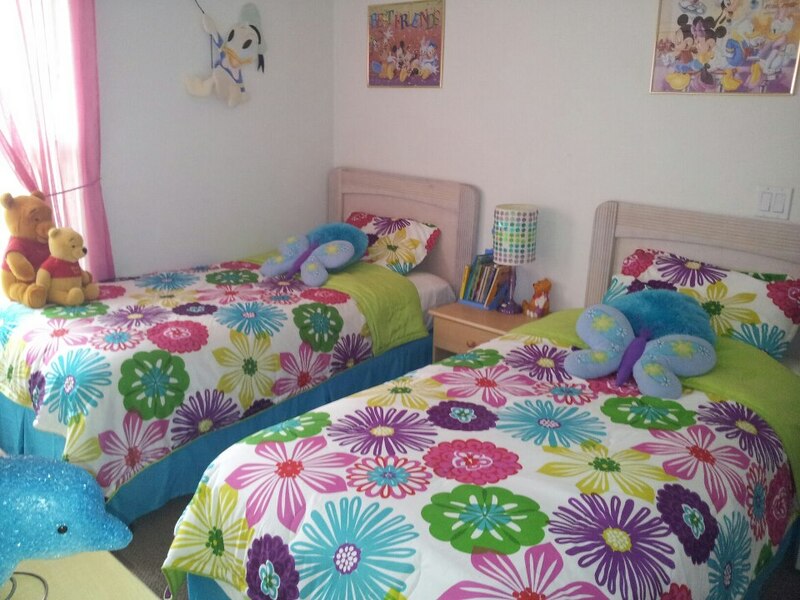 Both of the two twin rooms are also equipped with cable television, the first twin is more suited to children, and is decorated in a childrens theme, equipped with a selection of toys, books and a night light. The other beautifully appointed twin overlooks the pool, and is thoughtfully furnished having a large closit and clock-radio alarm. There is also a second house bathroom and shower situated between the other bedrooms with good access from the pool area. The well equipped dining kitchen has all you will need and more, including a dishwasher, wide bodied cooker, microwave, toaster, coffee maker and fridge freezer with ice maker. Our utility room houses an automatic washing machine, tumble dryer and ironing facilities. There is a large open plan dining room, which leads into the spacious lounge. Our lounge is comfortably furnished with a luxury suite and is the ideal place to relax with a glass of wine or two! after a hard day at the parks. The lounge benefits from a large 42" LCD/HD cable TV, DVD-player, VCR and a selection of children’s videos, a book library, a selection of family games and a music system. There is also a Play station 2 and games for the kids, and big kids in your party. Patio doors open from the lounge onto our spacious South facing pool deck and lanai, on a safety note, the doors are fitted with an alarm system to stop youngsters venturing out without supervision. The large South facing 30’by 15’swimming pool, has solar heating and optional gas heating for the winter months. 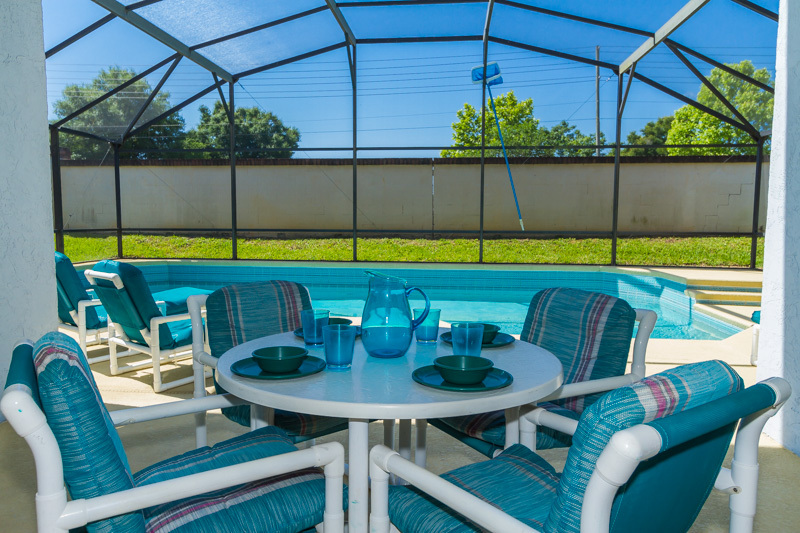 Our pool deck and lanai are luxuriously furnished with comfortable well padded chairs, table and recliners on which to soak up the best of the Florida sunshine or watch the beautiful sunsets. 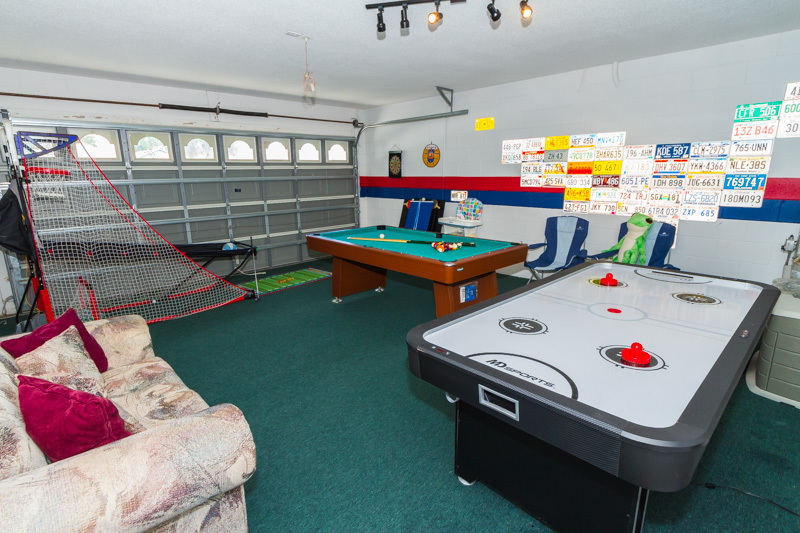 The villa benefits from a fantastic new games room, located in our fully carpeted garage, equipped with All American "Games Centre", 7 foot pool table, air hockey, Darts etc. Electricity is included, however there is an additional charge for the gas heating for the pool should this be required. 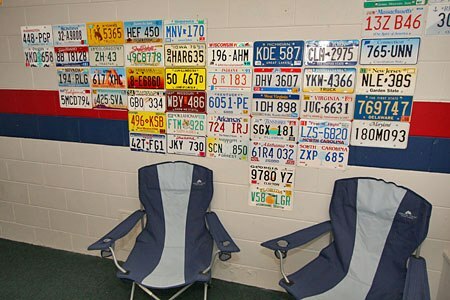 All towels and bed linen are provided, and there is also a hair dryer, buggy, highchair, cot with bedding and safety deposit box at no extra charge. Indian Ridge is located just off US 192 very close to Disney, and is less than a 10 minute drive to Animal Kingdom. It lies next to the Mystic Palms golf course and is very convenient for both golfers and park hoppers. Indian Ridge offers a community pool with a shaded deck, tennis courts, basketball courts, and a playground. It's situated just 5 minutes from plenty of shopping areas and restaurants. Indian Ridge Oaks is also it's a great location to explore all the Orlando theme park attractions. The vacation homes in Indian Ridge Oaks Kissimmee fl vary in size but are typically 4, 5 and 6 bedrooms. Many of the Indian Ridge Oaks homes have private pools, so if such a feature is important, be sure to ask for it when making a reservation. Also be aware of the season you will be travelling as in the winter most homes charge an extra fee for pool heat (if requested) if your home has a private pool. Most of the Indian Ridge Oaks villas come with a two car garage and sometimes double up as a playroom for the kids as many owners put in pool tables and foosball. Major shops and restaurants are located close to Indian Ride Oaks Orlando Florida being just 2.5miles away (located on Highway 192). Orlando4Villas opinion, Indian Ridge Oaks Kissimmee offers much for the family coming on vacation to the Orlando / Kissimmee area. 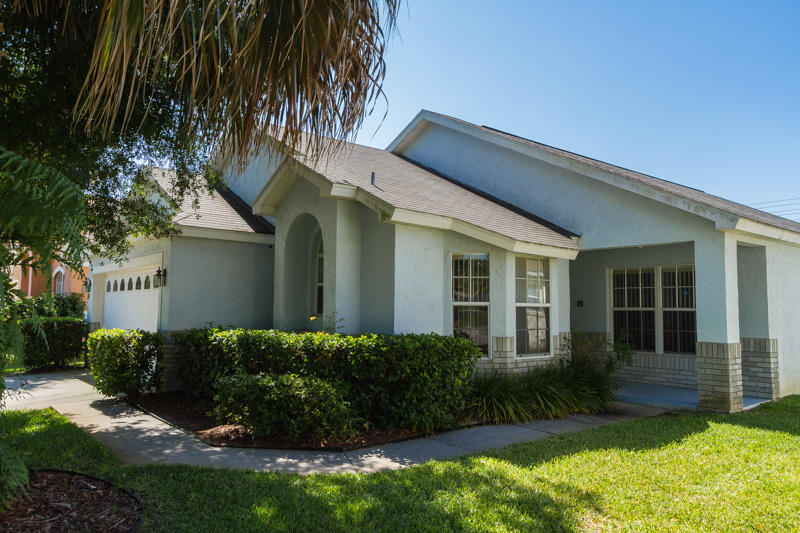 The Beautiful homes on Indian Ridge Oaks are situated in a walled neighbourhood and with no through road for traffic making the community very peacefulOrlando4Villas has the large selection of vacataion homes available for rent in Indian Ridge Oaks.